We are always looking for an opportunity to test new digital marketing tools or platforms for our clients. One recent opportunity was with TeamSave, a social buying website that helps consumers save money by purchasing services or products as a group. TeamSave is one of the first businesses to come out of Ryerson’s Digital Media Zone (DMZ); an innovative entrepreneurial environment that allows students to collaborate, develop and market digital technologies. 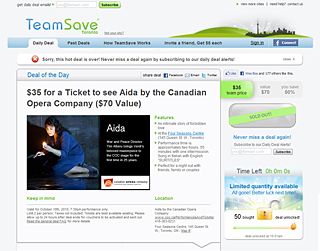 Through our close association with the DMZ, we approached TeamSave with the idea to use their platform as an alternative sales channel for the Canadian Opera Company (COC) to sell last minute single tickets and to expose the COC to a new audience. Our test involved offering 50 single tickets to TeamSave’s buying community for a COC performance that was only 5 days away. The COC was willing to provide these 50 tickets at 50% off the regular price. Considering that attendance to all COC performance exceed 90%, there has never been a need to provide a discount any less than 50%, and being able to hold this maximum discount would be the true test of TeamSave’s success. Working with TeamSave went extremely well, and we were able to get the offer up and running within 48 hours of our first discussion. The offer was launched at midnight, October 12th, and by 9 am on October 13th, they had sold their first ticket. By 3pm that same afternoon, all 50 tickets were sold out. Not only did we demonstrate that team buying on the Internet works for Opera and is a legitimate and useful channel to sell last minute tickets quickly at an acceptable price. We also demonstrated that Ryerson’s DMZ can successfully create entrepreneurial businesses that can deliver real results in the business world.